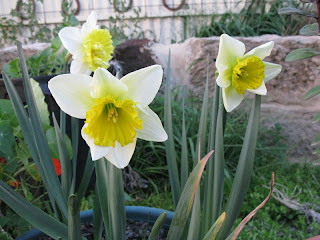 I've never grown daffodils before, so I'm thrilled to bits to have these three flowers. I've always loved daffodils and jonquils, but couldn't grow them while I lived in the tropics. I have lots of others coming on, but they aren't ready to flower yet. I just hope Dolly doesn't decide to investigate them too closely. I finally have Row D of my Dear Jane finished, a couple of the blocks seemed to take forever. 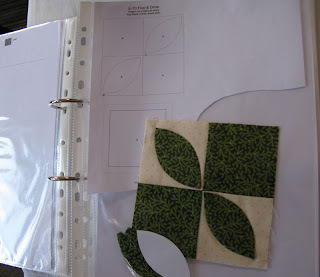 They had to be pieced with tricky set-in seams, and as if that wasn't enough, tiny pieces appliqued onto them afterwards. It took hours to get them done, I was shattered by the effort. Mereth sort of said 'I told you so' while I muttered over the little bits of confetti I was trying to stitch in place. However, I'm still enjoying the overall process; it's just that some of the blocks are more daunting than others. And some are plain ugly, which isn't encouraging. Each block is filed in the correct order; all the blocks from the first four rows are sewn together, but the random blocks are stored in the plastic sleeve with whatever is left of the printout. When I print out the block outline, I choose the option to print two to a page. 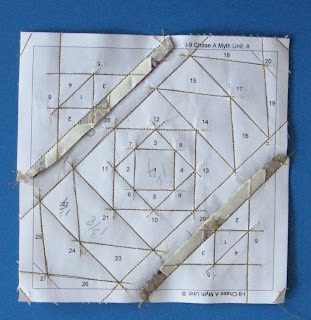 It's making use of paper that would otherwise be wasted, and if I want to make the block again I have the printout there already. Now I'm all ready for Row E, which I hope to finish before I pack the whole lot away again and get on with some larger projects. As much as I love the little blocks, the fiddliness drives me wild. I need to work with some 3" strips for a while. To say that I've been busy for the past two weeks would be an understatement. I've been Frantically Busy!! But I think I'm about caught up on everything, so I'll be able to stop and draw breath soon, and then get into my sewing room. I can't wait for that. I had to go shopping at the Janome dealer in the next town, and they are having a promotion where they take old machines as trade-ins. This little green Singer was traded in, and I thought it should come home with me. It's been well looked after, the paint is spotless, and I intend to make sure it stays in good condition. 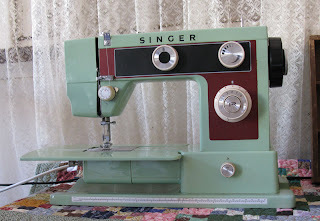 I'm powerless to resist green sewing machines it seems. A chirpy voice kept announcing on the sound system 'It's easy to shop at Ikea, if you know how!' and then giving details of guided tours about to start. Surely you shouldn't have to have lessons on how to shop? John and I got lost, and he expressed grave disappointment that his 20 or so years of navigating through tricky computer game scenarios hadn't actually helped him remember where he was in Ikea. I suggested someone should make a game set in an Ikea store; it has possibilities. Mereth bought a Billy bookcase, which she's been wanting for ages, and I got some modular shelving for my laundry. And big terracotta pots. And an ex-showroom sideboard. It took some creative packing to get it all settled into the back of Wilson, I'm so glad I've got a station wagon; a normal car just wouldn't be adequate. 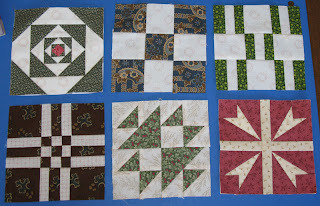 Stolen moments of time in the sewing room have resulted in several more Dear Jane blocks; I have around 65 now, and I should be able to sew Row 4 into one piece tomorrow. I am making steady progress. 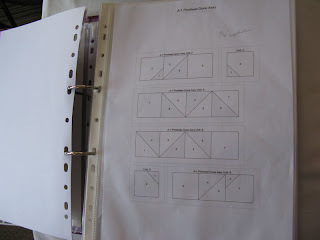 I was getting hopelessly confused with all the pattern printouts and templates and stuff, so I'm collecting it all into a ring binder, which should make things easier to find. I'll show you that tomorrow, I'm off to help Mereth put together her bookcase. It's just like adult Lego. 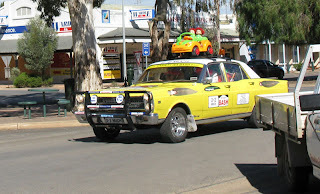 When Mereth and I walked up to the Post Office this morning we were somewhat surprised to see lots of strange vehicles in the local park, and some very dubious looking men in red skirts hanging around the public toilets. 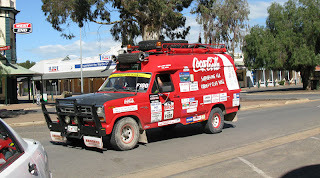 It turned out to be a comfort stop for the Variety WA Great Deserts Bash 2009, which began this morning in Adelaide. 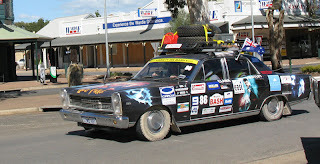 They will drive this mad assortment of decorated cars through the outback to Alice Springs, then on to Kalgoorlie and Perth. They looked like they were having fun, with sirens and air horns to announce themselves. These Bashes have been held for decades, and raised loads of money for sick children, and everyone supports them. What a way to see the country! 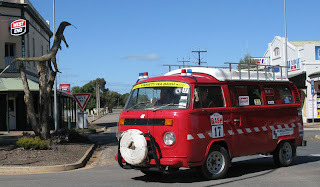 I particularly liked the Harry Potter car, and this Kombi-van pretending to be a fire-engine was cute. I hope they all have a great time on their trip, they have a loooong way to go. And this is my favourite ever Dear Jane block, I adore this one. 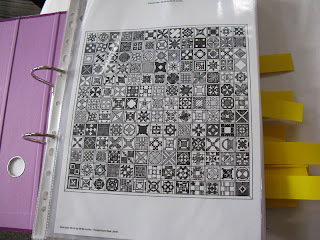 I want a whole quilt made of these blocks, but not 4.5", more like 9 or 10". I have 63 blocks now, I need 4 more to finish Row D. Once I start on the little blocks I get obsessed and just want to keep making them; pity I have all this work to do instead. 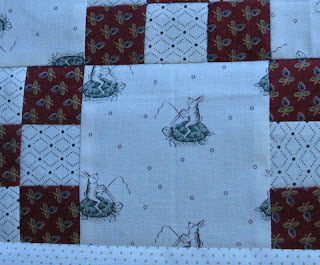 The sum total of my sewing for the past week is this Dear Jane block, all 4 1/2" of it. I should be grateful I had time to do that much, as I've had a frantically busy week. 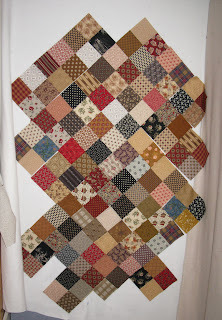 I sat and made this block as a stress reliever, while I watched an episode of Inspector Morse. I started sewing as the opening music played, and I was pressing the finished block when the final credits rolled. So that means this tiny block took 90 minutes to make; unbelievable! I just can't seem to get up any speed with foundation piecing, but I should be happy with the accuracy and not fret because it takes so long. 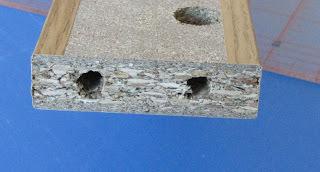 I need to get into the zen of foundation piecing; when you are foundation piecing, KNOW that you are foundation piecing. We'll see if that helps next time. 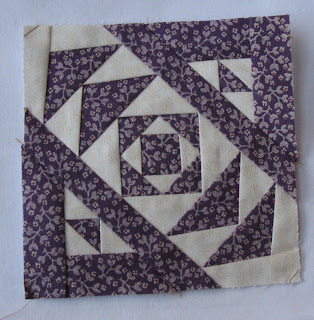 I often modify the suggested piecing; I couldn't see the sense of adding a triangle of the same fabric in the corners, so I just extended the sewing lines. The block looks the same, but it's two less seams to worry about. My garden is producing a few winter flowers, but Dolly has proved to be an avid gardener. She likes smelling all the flowers, then rubbing her face in the plants, then grabbing them with her nouth and uprooting the lot. I guess she just gets too enthusiastic, but it's disastrous for my flowers. I have growled at her, but she keeps reoffending. If she shows up with dirt on her nose it means there's trouble in the garden. As soon as she realises I've discovered the crime she's all cringing and contrite, but it doesn't stop her from doing it next time. I'm considering barracading all my pots behind the potted roses, because she has a healthy respect for anything with thorns! 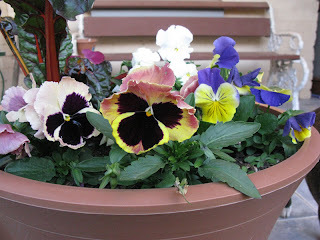 I love pansies, but these flowers are almost tooo big, the stems can't hold them up. They are such sweet flowers, I love all the variations in the colours. 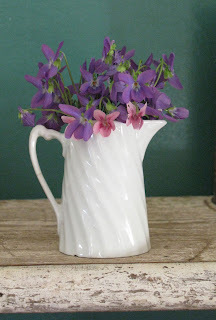 But the violets are my favourites I think, they smell so wonderful. 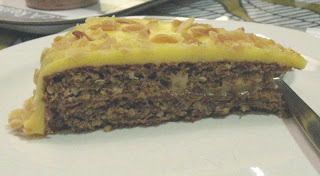 The pink ones came from Mereth's MIL, from the family farm. Mereth has planted them in every garden she's ever had, and carried pots of them from place to place and shared them with many friends. They are like a family heirloom. Last week was just a blur, lots of places to be and appointments to keep. The night away with our DB and SIL was wonderful, a nice little holiday. We had a very nice anniversary dinner at the hotel, but the service was hardly great. After the first course the waiter picked up the plates but put the used cutlery back on the table, saying, 'You'd better hang on to that.' ??? SIL very nicely said 'Oh I think we'll have fresh cutlery for our main meal', and smiled sweetly. So he went off with a bad grace, came back with new sets, and scarpered off without picking up the used knives and forks. Hmmm. SIL gathered it all up and put it on another table, where the waiter came across it in due course, and tutted disapprovingly, with a few black glances in our direction. It wouldn't have been annoying, except that it was a swanky place, trying very hard to be upper crust. And the waiter obviously thought he was little bit better than his clientele. Never a good attitude. It says a lot that there were more staff than customers. But the food was OK.
After airport duties the next day we popped into Ikea and did our best to shop, but there's something about that place. Mereth and I both get totally overwhelmed by all the stuff, and we just want to go home without having to make any decisions about what to get. One of our friends has the same reaction, and we're planning a joint assault where we can egg each other on. It may not work; we'll probably talk each other into leaving empty-handed. 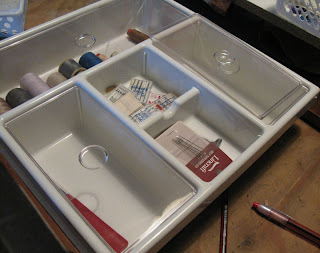 I did pick up a set of these bathroom organisers; they are good to keep by the sewing machine to corral all the little bits of stuff. There is a cabinet that these fit into, and I may splurge on that one day, if I can ever make a decision; I tried to find them on the website, but I have no idea what they are called. I like the lids to keep out the dust, we have a lot of dust in this town, so a little protection is good. 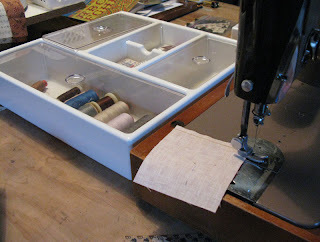 They fit nicely behind my sewing machine, so I can keep spare cotton and needles and gadgets handy. Over the weekend I was determined to finish the nine-patches, because they were taking up every spare inch of room, so I put on an Inspector Morse DVD and gritted my teeth and began to sew. It took Forever! (Three ninety minute episodes). 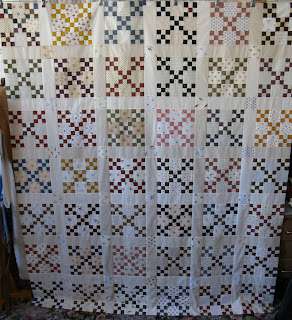 I still have to do the border, but that can wait a while; I'm a little tired of this particular project. 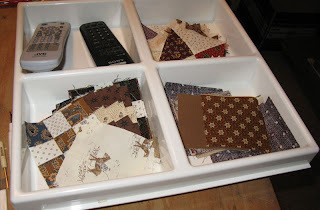 It's used up three pieces of cream fabric from my stash, and lots of the conversationals, so it's been a good stash-buster, even if most of the blocks came from Kaye's stash originally. 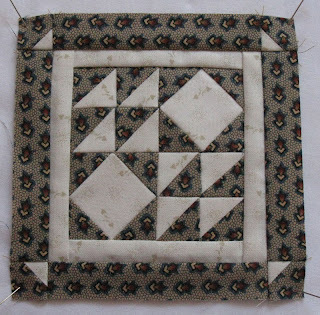 And I may have sewn a few of these squares together as leader-enders. I'm liking how it looks so far, but I need to cut More!